I have been wanting to post some of my work, but haven’t taken the time until now. 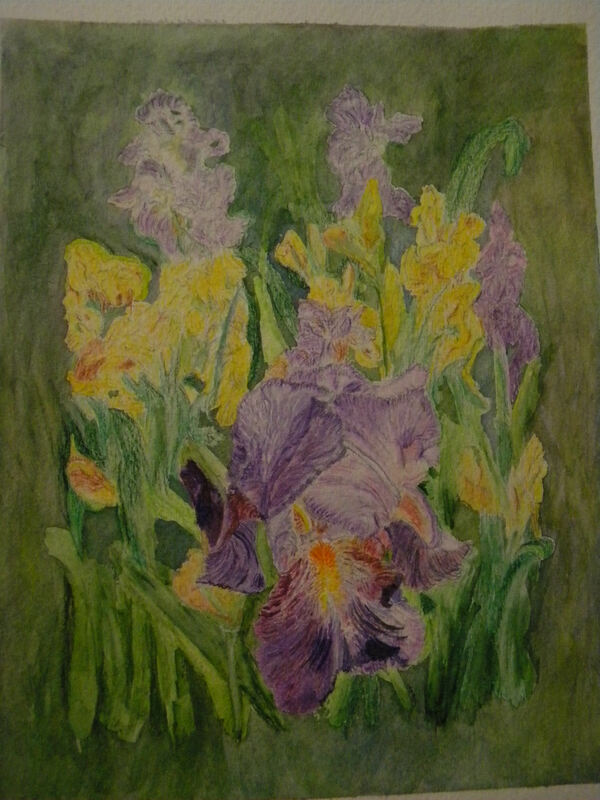 I did these two Iris paintings several months ago. But when I decided to post these, I also thought it might be nice to pay tribute to someone. I painted these for someone with whom I was friends with for twelve years. Her name was Andrea. So I have decided to share some of my thoughts about her with you. Andrea was about 70 years old when I met her. My husband had to move to this area for his job a little over twelve years ago. I met her at the little country church we decided to start attending at that time. My kids were almost two and four years old at the time. Andrea fell in love with them. I was missing my mom terribly whom we had just had to move away from. The kids were missing their Grandma (and Grandpa), too. They were used to going over to her house several times a week then. So the move was very hard for us all. When we began attending this church, it was very small, and there were no other children attending. We were the youngest couple there! Most of the couples were in their 60’s and 70’s, except our Pastor and his wife. I think they were in their late 50’s at the time. So you can imagine all of the attention our children received. My son was a little shy at first, but my daughter wanted nothing to do with anyone except me. She wouldn’t let anyone hold her, and she backed away from anyone who tried to hold her. I was shy also so I was pretty protective of her. Strangers in a new place whom I knew nothing about yet were not going to just get to hold my baby girl! But eventually, she went to people while still staying close to me. Getting back to my story about Andrea. She loved our kids. She had no grandkids living nearby, and hers were school aged by then anyway. So it had been years since she had been around children their ages. But Andrea was really respectful of my boundaries. Slowly we formed a friendship that I will always treasure. I began calling her at least once a week to just see how she was doing and ask if she needed anything. We also ran into each other at Walmart at least once a week, and I always had the kids with me. I didn’t have anyone to leave them with any more for a few hours to go run errands. Plus we live about a 40 minute drive from town, so I had to get done with as much as I could in the early mornings before the kids needed naps. Sometimes they fell asleep on the way home, though. So for several years this running into each other at Walmart went on. I got to where I hoped we would see her, and seeing the kids always made her day. Andrea was always kind to me, listened to me, and asked how my day was whenever she called me. For about the first 10 years we were friends our phone calling was never planned really. We were both spontaneous and on each other’s minds often. It was a great deal like my relationship with my mom whom I never stopped missing. My mom and I saw each other often, but the drive to visit Grandma was about four hours one way, so it had to be a weekend trip every time. Needless to say with my husband working a new job, we were only able to visit a few times in the summer and during the holidays. Settling into a new place was time-consuming. I missed my friends and kept in touch with them on the internet. But making new friends my own age or closer to my age than 15 or 20 years older than me was a challenge. If it hadn’t been for Andrea I would have been consumed with loneliness for companionship with women friends. Our pastor’s wife was great, too, though. I started going to her small women’s Bible study which helped, but Andrea didn’t attend it. I never could get her to come. She just didn’t like getting out any more than she had to at that point in her life. And I could understand that. My mom was the same way. The things I loved about Andrea the most were her smile and laugh. She also had a deep voice and was a little on the ornery side which I loved. She had many trials in her life, but she always trusted God to get her through them. Our church was praying for her and attempting to help her, but she was pretty independent. Her son lived with her, but for those first few years I knew her, she was still driving and getting out by herself. Andrea and I had a great mother-daughter type relationship. When my mom passed away in 2006, Andrea was there for me like no other woman I knew had time to be. I could cry on the phone and she would pray for me or more often would talk about something that would get me laughing in no time. She had daughters who live far away, and one of them had cancer for many years. She was about my age and had teenagers and a husband. But Andrea could only talk to her on the phone, because she couldn’t travel. When her daughter passed away, I was able to be there for her as well. Things didn’t change until about two years ago when her health began declining. She couldn’t talk on the phone as long and didn’t want visitors any more. It was a hard time for me, but she knew she wasn’t going to be here much longer. She talked about wanting to just go to Heaven and be with the Lord where she could rest and be forever healed. It was then that I began letting her go emotionally. So for the last two years of her life, I was mostly able to only pray for her and talk with her less often. She stopped coming to church which was really hard for me, but it took her so long to get up and get ready that she said she had no energy left by the time she would get home. I understood and so did others. Andrea passed away early this summer. I miss talking to her every week. I miss her smile and laughter. I miss the smell of her perfume and her hugs. She was a faithful friend. I’ll always remember my sweet and wonderful friend whenever I see Irises. I think she is one reason that I love to paint any flower so much. Give someone you love a hug today. It will bless them more than you may know. Posted on August 5, 2013, in Watercolor Paintings. Bookmark the permalink. 4 Comments. I had a friend like this. Haven’t been able to write about her yet. She passed Spring of this year. Love the Iris paintings. Beautiful. Wow, I’m sorry for your loss. Andrea was pretty special to me also. I miss her all the time. Thanks so much. 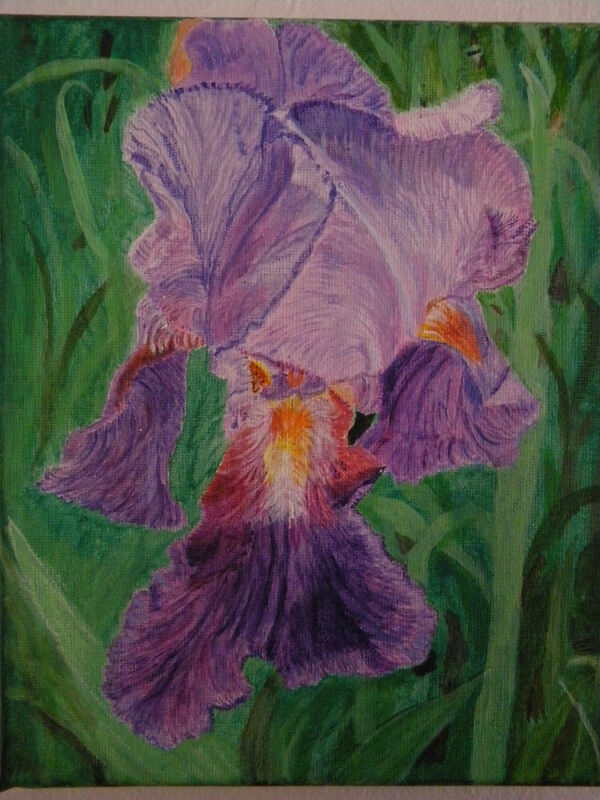 I enjoyed painting the Irises, but it has been the most challenging flower I’ve painted yet! Andrea was a jewel. I miss her, too. Thanks George. I know you do. She was a great friend to us.